So you want to subscribe but you haven’t done it yet and you want to read the magazine anyway. Deary me…We can’t have you missing out entirely. The delicious Autumn Edition is now available in the archives! In the Autumn Edition – 7 Sensational Subscriber Giveaways – A visit with a Prince in one of the most remote places on earth – The smallest and rarest dolphins on the planet, where you can see them and even swim with them if you’re keen – The stunning village of Hobbiton and a few secrets behind the famous Hobbit movie – Insider’s view of professional book design from someone who does it for a living – New Zealand’s Incredible Milford Sound, no it’s not a rock band. 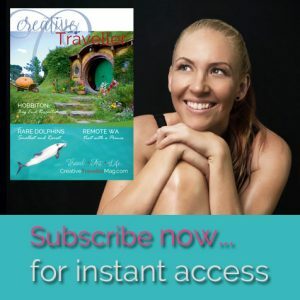 Subscribe now (for free) and you’ll get instant access to ALL the delightful articles and travel joys as soon as the new edition is broadcast!